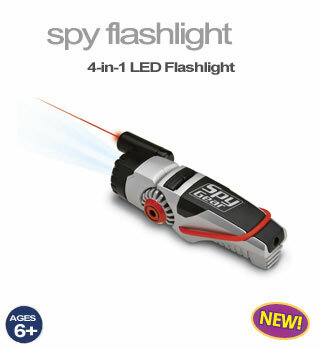 HUGE 2010 SELECTION OF SPY TOYS FOR KIDS! When In Austin, Texas-- Stop By Our Huge Showroom! This small car camera is the perfect covert surveillance item. Its designed to look like a BMW so it will fit in perfectly with either a car buffs collection or a childs toys. This is no toy however, it houses a fully functional color camera and DVR unit. This particular unit even features sound activation. And just to top it all off, the headlights actually work and in fact function as your indicator lights. The unit also comes with a suction cup stand that allows you to use your tiny car, as a car cam. Evidence Kit™ - NEW! Mobile Forensics Set! 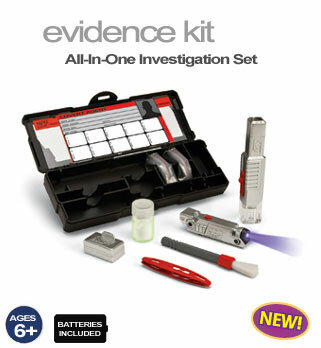 The Evidence Kit is a mobile forensics set that includes a 30X microscope, UV light, fingerprint kit & glow-in-the-dark powder. Collect fingerprints of potential suspects and file them on your ID card. 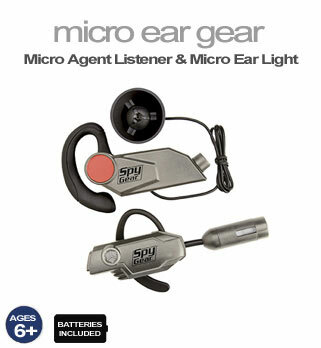 Take your essential spy tools with you wherever you go. These four gadgets come attached to a utility belt for easy access and ultimate portability. Use the Motion Alarm to guard doorways or protect documents – an alarm will sound to let you know when someone crosses its invisible beam. Wear the Lazer Light on your fingertip and point into the darkness for instant illumination. 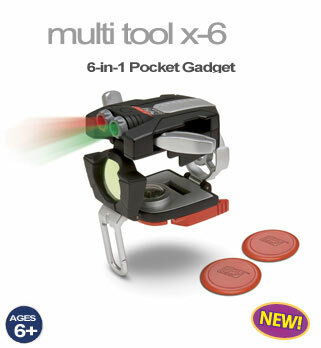 Be ready for action and ready to move with this 6-in-1 pocket tool! 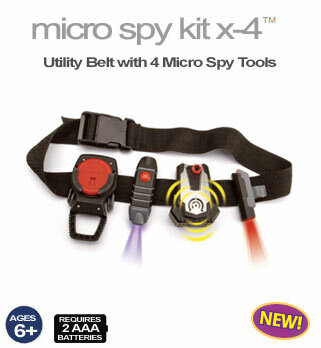 Navigate your way through dangerous territory, communicate with fellow spies, blow the whistle on intruders, and defend yourself against enemy agents! 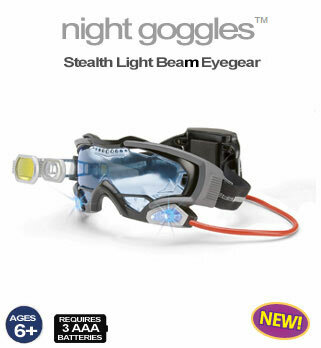 With bright blue LEDs attached to your goggles, you can keep your hands free for collecting clues on nighttime missions. The lights allow you to see up to 25 feet in the dark, while the pop-out scope magnifies your view through tinted crosshairs. 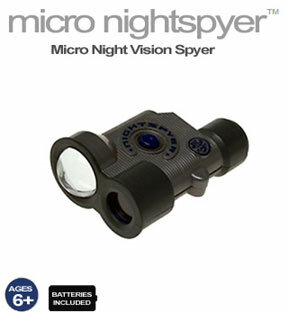 The Micro Nightspyer lets you illuminate the night on your secret spy mission. Press a small button and a red tinted focused light beam allows you to see your target in the dark. The 2x power telescopic lens permits visibility up to 25 feet. Secret Agent Briefcase™ - NEW! 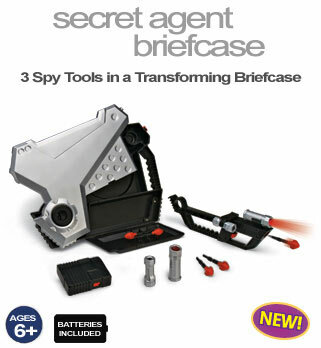 3 Spy Tools in a Transforming Briefcase! A dart-launching briefcase complete with secret compartments and spy tools; includes a removable red lazer light and vision scope, DVD holder, storage space, dart blaster & four darts. What's that? Out there... in the bushes! 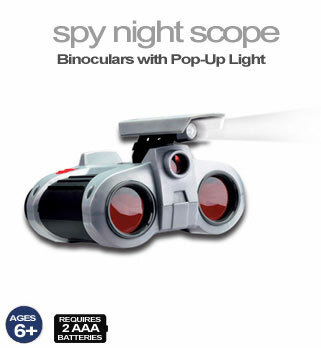 Put your Spy Night Scope™ in stealth mode and you'll know if it's an intruder or just the neighbor's cat. Protect your stuff from sneaky enemies! Attach the four retractable lines to book bags, desks and more! 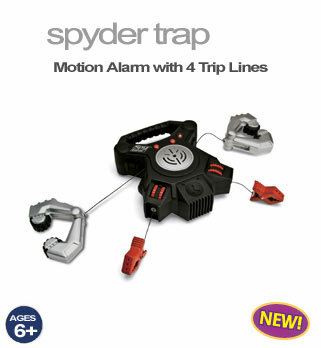 These motion-sensitive trip lines catch intruders coming from every direction. Alarm and lights sound an invasion! Touch activates the alarm! Protects over 23 square feet! 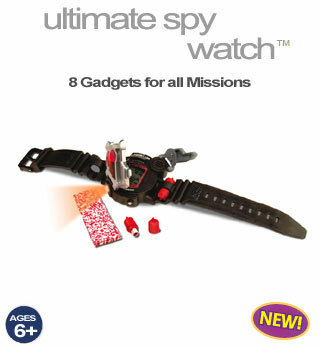 A spy watch for the 21st Century! 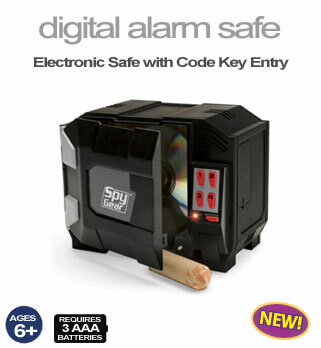 State–of–the–art electronic gadgets, world time, even a motion alarm and a decoder screen, all protected by locking armor. Everything you need for any mission! Features a stopwatch, flashlight, world time clock, wake-up alarm, locking armor, motion alarm with timer, 2 safe-drop message capsules and special spy paper! Two blasters in one! 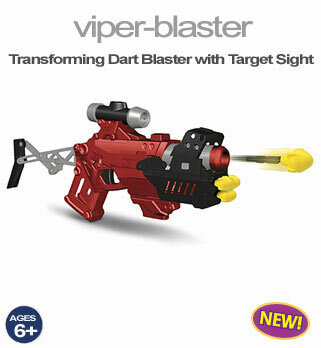 Use this transforming dart blaster in handheld mode for split-second defense tactics, or expand it - it morphs into a precision shooter! Use the targeting sight and you'll get the perfect shot, every time! Write and reveal secret messages! 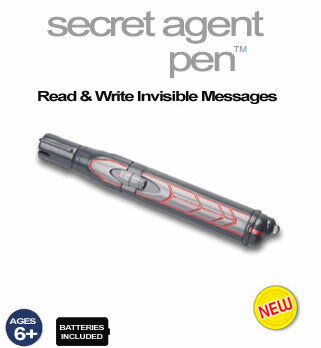 Write an invisible message that can only be revealed with the UV light! Stay in contact - every spy needs to talk to HQ! When the coast ISN'T clear, use the spy code key to send your partner secret coded messages! 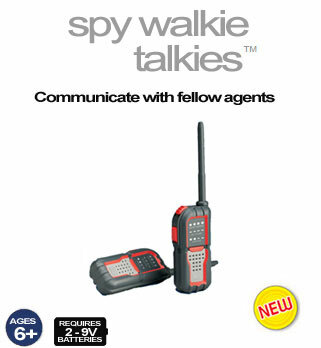 Set of 2 walkie talkies with spy code. Protect your secrets from enemy eyes with this high-tech safe. Set your personal four-digit code and lock up your stuff. A voice alarm alerts you if someone tries to hack the code! 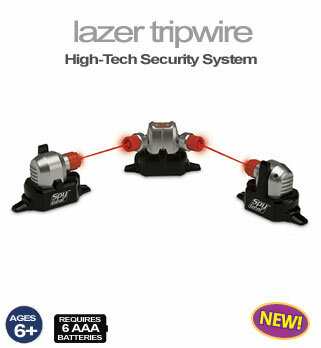 Lazer Tripwire™ - NEW UPDATED VERSION! The new Lazer Tripwire creates a field of invisible beams that can be arranged to guard rooms, people, objects – anything that needs protecting. The redesigned receiver and emitter pods can be set on various surfaces to form straight lines of invisible light that trigger an alarm if someone crosses through them. 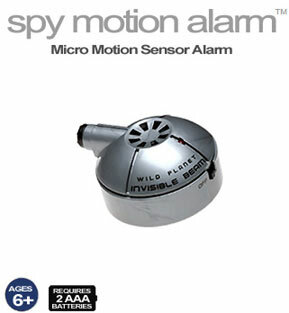 The micro Spy Motion Alarm is a micro light sensor. When an "intruder" breaks the light beam, the alarm sounds. Set it up it across a door or in a hallway. 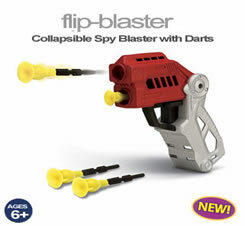 Hide this double-barrel blaster in your pocket, and unleash a shower of darts when they least expect it! Transforms with a flick of the wrist from regular blaster to pocket size. Put the power of lasers in your hand! Flex your fist at your opponent and an invisible laser-like beam moves towards their tagger. 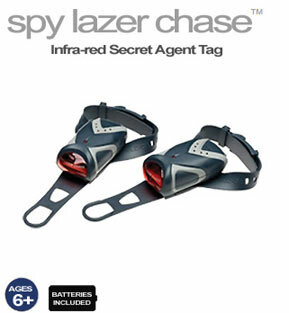 No need for targets or flags, all you need is your Spy Lazer and your fastest moves. Infra-red lazers may not transmit in direct sunlight. For optimal transmission, use inside or at night. 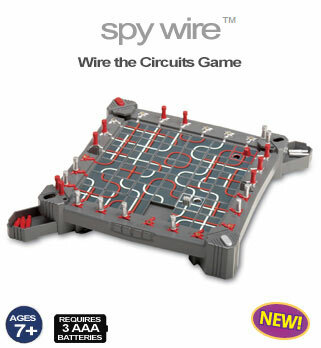 Spy Wire™ Puzzle Game - LAST CHANCE! A Puzzle Game in which Players Race against the Clock to Deactivate their Opponent's Fuses! Players strategically slide tiles to make connections between their defuser and their opponentï's pegs. Each player has nine decoy pegs and three detonator pegs. The goal is to collect all three of your opponent's detonators as quickly as possible. Copyright: 2010, SpyTek, Spy Exchange And Thomas Investigative Publications, Inc.